I love baking with almond extract. When you bake almond pastry your house smells delicious. This almond pastry is really easy to make, the hardest part is mixing the eggs in and that isn’t too bad. Totally worth making, this is delicious. Directions for the crust, mix 1 cup flour, ½ cup MELTED butter and 2 TBSP. water in a medium bowl. Mix well. On a parchment lined cookie sheet greased with cooking spray, Using your hands, spread the dough evenly. It will not cover the entire sheet, just get it thin and spread out as good as you can, (see photo) set aside. Filling instructions, put butter, water in pan, bring to a boil. Remove from heat add almond extract flour, stir until smooth & thick, add eggs one at a time, beat in until smooth. Put filling on top of crust, spread evenly, (see photo). Mix sugar, milk and almond together, drizzle on top of pastry. On top of that I place maraschino cherries to decorate. TIP: sometimes I add maraschino cherry juice to glaze to give it a pink/red tint. You may need to add more sugar if glaze is to runny. Slice to serve. Your Almond Pastry will be a great pastry to serve! Hope you have a great Valentine Week and thanks so much for sharing with us at Full Plate Thursday! Love this pastry! Almond flavor is a big favorite of mine and my family will love this! Thank you for sharing at Celebrate It! 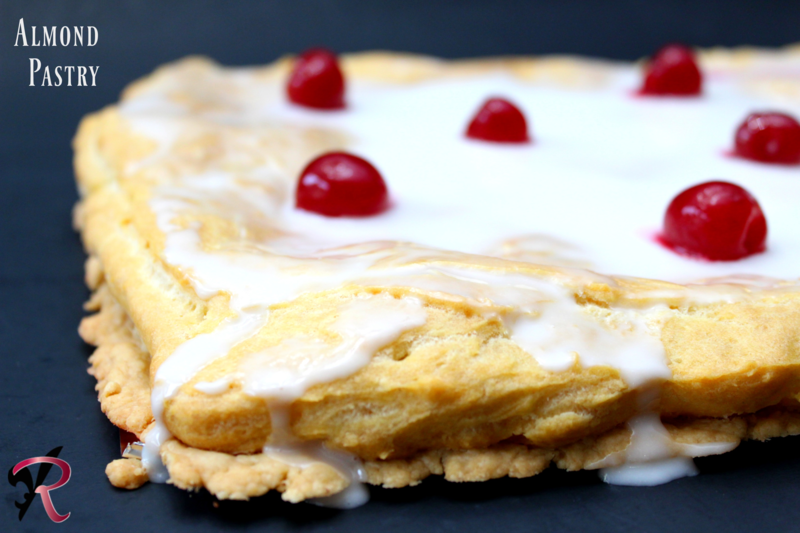 Your Almond Pastry is featured this week!